This week Strands of Thought is excited to host Kelly from Down Under Calling. It’s nice to meet you Kelly. Tell us a little about yourself. Andy lives in a tiny condo down the street from my house. His parents are still married, but his dad got downsized – hence the condo. My parents are divorced, so neither of them take much notice of me. I don’t get why they divorced – they still fight every time they see each other. I also inherited a bunch of step-grandparents when both of them remarried. All of them give me stuff. Why is that? I guess they think gifts and money will make me feel better about the divorce – kinda crazy thinking. . . right? Divorce is a difficult situation for everyone involved. What would you like to see happen to fix it? I want Mom and Dad to look at each other the way Andy’s parents do. I’ve seen them sneak a kiss. Andy doesn’t realize how good he has it – even if he did have to trade his dog and home for a itsy-bitsy condo. Lots of happy families all around the world live in condos or apartments. What are some of the biggest stumbling blocks you’ve encountered trying to fix your problem? Mom never listens to me. And Dad’s new wife has a cow every time he visits with me. So you guessed it, I hardly ever see my dad. You know at school we learn all about the major stuff adults think we need to know – except how to be a first-rate parent. I say, Parenting 101 Class for all those who flunked and got divorced! What have you learned about yourself or Andy while dealing with all of this? Andy hates that crummy condo, and I don’t blame him. He had a really cool home before his dad was downsized, but the bank took it back. I think he’d like to live in my super cool house. Fine by me – as long as I can be adopted by HIS parents, and live with them. Tell us more about Andy. I guess Andy and I are best buds. But lately, he acts all funny when I come over. What’s with that? He has a really cool grandma though, in Australia. She sends him letters – all about the weird Aussie animals that come to her garden. She writes him about what it was like growing up Down Under, in ancient times. Super hard to believe – I mean, no phone, no washing machine, and no TV? The animals are definitely awesome. We Google them for more details. His Grandma Rose is a REAL grandma though – the kind that actually cares about him. Now, we’d love to learn more about you, Kelly. Is there anything about you that people are always giving you a hard time about? How do you feel about it? “Get over it!” Just about what I expected from her. Reading, my XBox, and listening to the latest in pop. Wait though: I guess I haven’t done much of that lately. Too busy sharing letters from Grandma Rose (Andy lets me read them), riding bikes together, bird watching, learning about Grandma Rose’s Aussie critters on Google, and reading in the park – if no birds are around.. Hamburgers for one. Plus yummy hot ham-and-pea soup, with chunks of French bread. And chocolate cake with ice cream of course, plus lots of creamy frosting – De-lish! Maybe a counselor that helps kids with crazed divorced parents? There’d be a ton of work for me. Half the kids at school have divorced parents. I’m reading The Revenge of Thelma Hill right now, a creepy ghost mystery. I like books that take me different places - scary adventures with a bunch of action and fun. Like Taconi and Claude – Double Trouble, all about an aboriginal boy in Australia and his talking cockatoo. I’d get people all over the world talking to each other - ordinary people, not just politicians. Once you start talking, instead of shooting, it’s much easier to find peaceful ways. And I’d make parents work on their problems – not give up and divorce, like mine did. Sure, I have crummy parents, but I’m lucky with my friends. Andy says that when his grandma comes to live here in Oregon, she’ll be my friend too. He says we always get to choose our friends. It’s our relatives we’re stuck with. And my friend Andy is awesome! 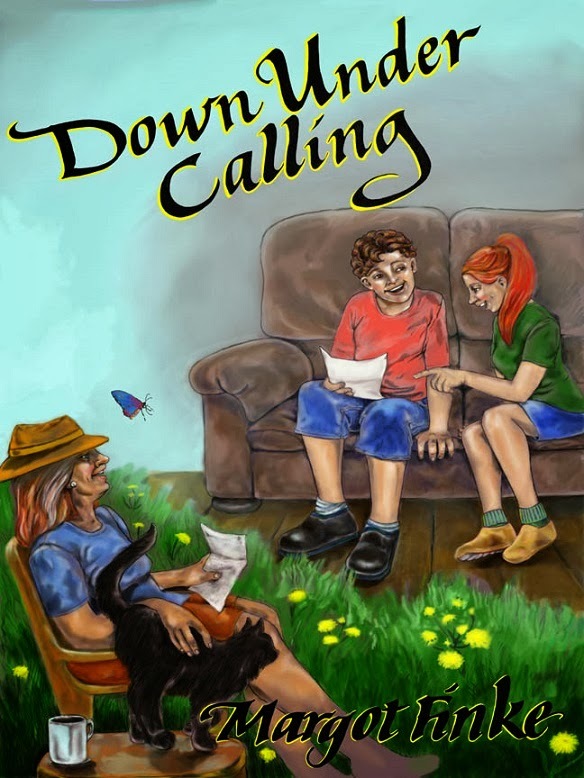 Readers, here is more information about Kelly’s story Down Under Calling. When a reluctant grandson in Oregon is pressured into writing to his grandma in Australia, wonderful things happen. Both have a need for love and reassurance. Back and forth the letters go. Josh shares his daily problems, and Grandma Rose shares past memories, fun stories, and what it was like growing up Down Under in the early 1950s. All this astonishes her grandson and his friend Kelly. And together they shrink the Pacific Ocean into a puddle they can easily ford. BUY Direct - Save $2 a book. Margot Finke is an Aussie transplant who writes midgrade adventure fiction and rhyming picture books. For many years she has lived in Oregon with her husband and family. Gardening, travel, and reading fill in the cracks between writing. Her husband is very supportive, and their three children are now grown and doing very well. Four grandchildren are the delight of her life. Margot didn't begin serious writing until the day their youngest left for college. This late start drives her writing, and pushes her to work at it every day. Margot says, "I really envy those who began young, and managed to slip into writing mode between kid fights, diaper changes, household disasters, and outside jobs. You are my heroes!" She has 13 books published, and you can see all of them on her Website + Links to reviews, covers, book trailers, sample writing, and how and where to buy. Downsizing is the reality of so many families recently, it's good that there are books for kids that address the issue. I agree. It is important for kids to see that life's circumstances can change, yet remain happy as well - with the right attitude.